Family owned and operated, we appreciate our Customers who continue to allow us to pursue the dream TJ Dykema built many years ago. 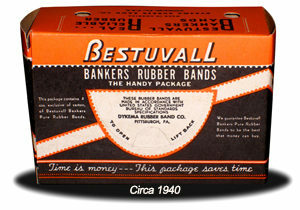 He initiated our brand of rubber bands known as Bestuvall. This year we celebrate 111 years in business. Through our Bestuvall brand, we continue to sell the highest quality 90% pure rubber bands. In the beginning, TJ focused on two products, rubber and glass. In 1938, he invented and patented the use of a rubber bulb on the tip of a glass tube inserted into the cap of a glass bottle, now known as a bottle dropper. The success of this product enabled him to expand the rubber band business. Our Customer base has continued to grow over the years and today we carry a full line of rubber band products. Our warehouse is located just outside of Pittsburgh, with sales offices in Pittsburgh and Western North Carolina. We are committed to offering quality products at a fair price and providing the best in customer service and support.